There are a number of companies selling electric heaters that imply that you will save a great deal of money, some even claim you will cut your costs by 50%. This is extremely misleading. It is sort of like claiming "Save 100% on your heating bills*" where * = "don't turn it on". It isn't a fraud, but is certainly misleading. 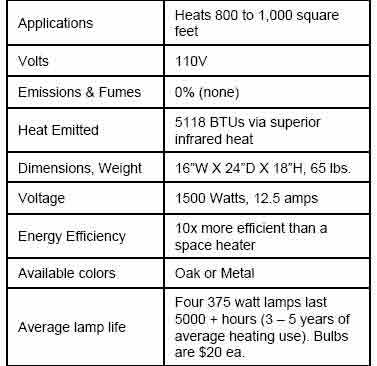 Examples are EdenPure, iHeater, so called Amish heaters, the chinese made Heat Surge Roll-n-Glow (their marketing material is the most honest of the bunch). All portable electric heaters consume electricity and degrade it into heat. All are 100% efficient for one obvious reason. The heat has nowhere else to go except into the room. Anyone that makes a claim otherwise, especially outrageous ones like "10x more efficient than a space heater", is making a fraudulent claim. a) no combustion, flames or fumes.This is true of all electric appliances,including your coffee maker unless something is terribly wrong. c)Does not dry out the air. Of course not. Electric heaters never dry out the air. How could they? Where would the water go? No matter how you heat up the air in a room, the warmer air can hold more moisture so the relative humidity will go down -- unless you want to use a humidifier, vaporizer or keep the kettle boiling on the stove. d) healthy comfortable infrared heating. Infrared is radiated heat, like you get from a heat lamp or the sun. The product details below imply that the heat source is four 375W heat lamps, but if they are inside the wooden looking box in the picture, then they are not shining on you. They would heat the box and the box in turn would heat the air nearby, which is called convection. 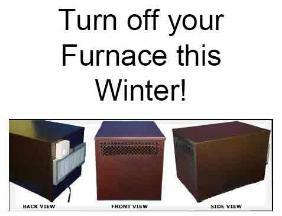 e)turn off your furnace this winter. There is nothing wrong with this statement. It is the means by which you will make those huge savings. The misleading part is that most people will assume that you will turn off the furnace because you don't need it and that you will be nice and warm. You won't be. The house will likely cool to about 10C/50F and the room with the special "heater" will be almost as warm as the room with the coffee maker. If you heat your house with natural gas, adding any kind of electric heater is a huge waste of money because gas is much cheaper than electricity per unit of energy. If you heat your house solely with electricity, then letting your house get cold and only heating the room you are in will save you money. Of course you can do this with individually controlled baseboard heaters too - and you don't have to lug them around. You could purchase several of these overpriced heaters and heat the whole house, but then you would be back to electric heat except that you would have traded inexpensive baseboard heaters which require zero maintenance and are silent for $400 boxes full of light bulbs, fan and filter. Some sites state you can just move it from room to room as you move about the house - all 65 pounds of it. The ads above are from Krystal Planet, whose founder is Troy Helming. Here is a link from the State of Missouri, Office of Secretary of State, to a court order against them. Here is another claim, this time from EdenPure. Cutting your heating bill by up to 50% (with an electric heater) means that you are going to have a very chilly house and one heated room. Q. Why is it that this quartz infrared heating source uses less energy to create heat than other sources? A. Actually, there is more than one reason. One of the primary reasons is that heat at combustion level, which is what all other heat sources use, causes the heat to instantly rise to the ceiling. Therefore, the heat is not evenly distributed, causing a very inefficient and uncomfortable heat source. 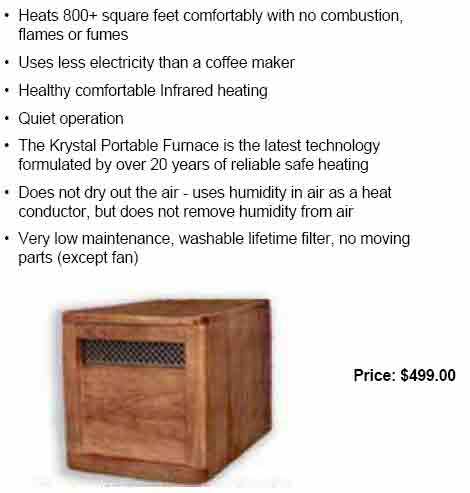 The EdenPURE Quartz Infrared Portable Heater does not use burning heat. Once the heat exchanger absorbs the infrared heat, it exhales the heat into the living area which is carried by the existing humidity in the air. This causes the heat to travel rapidly and evenly throughout a room. In actual studies, photos using infrared lighting demonstrated that the heat was almost perfectly even from floor-to-ceiling and wall-to-wall. The EdenPURE Quartz Infrared efficiency is based on the distribution of energized air, not on just fan movement. This heat is coined as "soft heat" due to how comfortable it is. a)Heat at combustion level, which is what all other heat sources use - like heating pads and hot water radiators for example? ( I am being facetious here) By combustion level, I can only assume they mean hot enough to catch paper on fire -- otherwise it is just a meaningless phrase. b)rise instantly to the ceiling - air at 200°F from a electric baseboard heater on full power does rise quickly to the ceiling, but that is why modern Honeywell baseboard thermostats start the heaters on low (sort of like a heat dimmer) and increase it only if necessary. Floor heating systems do an even better job since the floor must be warm but not too hot to walk on. Hot water radiators and even steam radiators are not "combustion level". c)exhales heat ... which is carried by the existing humidity of the air - this is funny personification, and I guess the room inhales. The energy in the heater (from burning electricity) is going to travel on its way from the heating element, to the heater's case, to your living room air, through the walls in your house and on into the deep reaches of outer space. To infinity and beyond! There is nothing special about this process, it is how the universe works. Humidity has nothing to do with this. Once the heater warms up, heat will escape through three different ways. 1) via conduction through the legs of the heater into the floor. 2) via convection when it warms up the air that it is in contact with it 3) via a small amount of infrared radiation. The majority of the heat loss will be via convection heating of air currents. d)efficiency is based on the distribution of energized air - The weather today is Energized, hazy and humid? This is a silly way to say that the air temperature was constant across the room -- as is the case for almost any properly designed heating system. "when you sit in front of a fireplace or a portable heater or close to a heat source, you will remember yawning. This is because you are not getting enough oxygen"
e) What utter foolishness. Electric heat does not consume oxygen. Furthermore,the yawn reflex is complex and is in no way related to being close to a heat source. Stop boring me, he said while stifling a yawn - you are using up all my oxygen! Q. What is the BTU Rating for the heaters? Heater is approximately 5000 BTUs. The BTUs are basically irrelevant as a unit of measure since the patented heating process of the EdenPURE® INTENTIONALLY does not operate using old inefficient methods of heat combustion, which is rated by using the BTU rule. Our heating method is far superior for efficiency, safety, comfort, and is providing a natural healthy indoor environment.. This is more absolute foolishness. There is no such thing as a BTU rule. BTU stands for British thermal unit and it is a measure of energy. Energy is not irrelevant. On the contrary, energy is the ONLY thing that is relevant. Remember, this is a heater. Just a heater, nothing more. It uses electrical energy (which you purchase in kWh) to warm up a heating element, just like a heating pad warms up, or a light bulb. If you want a good electric space heater, get a copy of Consumers Reports annual buying guide at your library, study the ratings, and then go down to Home Depot and save some money. a) A test of energy output would likely prove that the power labels are accurate. Testing the temperature of objects around the heater would also prove the obvious -- that they warm things up. Nobody is disputing this. b) The real test, whether you can feel comfortable in a room that is selectively heated by a low power space heater, is purely subjective. Some people might like it, others may not. Given their low power, it is likely to be quite cold once you walk any distance from the heater -- like backing away from a campfire on a cold winter night. c) I already have a radiant heater -- a huge one. Thousands of feet of piping under thousands of pounds of wooden and tiles floors turn the entire house into a 'radiant' heater. Instead of a fancy wooden cabinet getting warm, the wooden floors are warm and if I wanted to, I could turn on and off zones as I moved about the house. It wouldn't make much sense because radiant heating systems are slow to react and heat their surroundings. It is definitely comfortable, but not a money saver. The biggest advantage of hot water floor heating is that you can substitute any heat source, including solar hot water or geothermal which over the long run will indeed save you large sums of money. d) I mention Consumer's Reports because they will allow you to steer clear of any really bad products out there (heaters that get too hot or could top over) and will point out some good values.